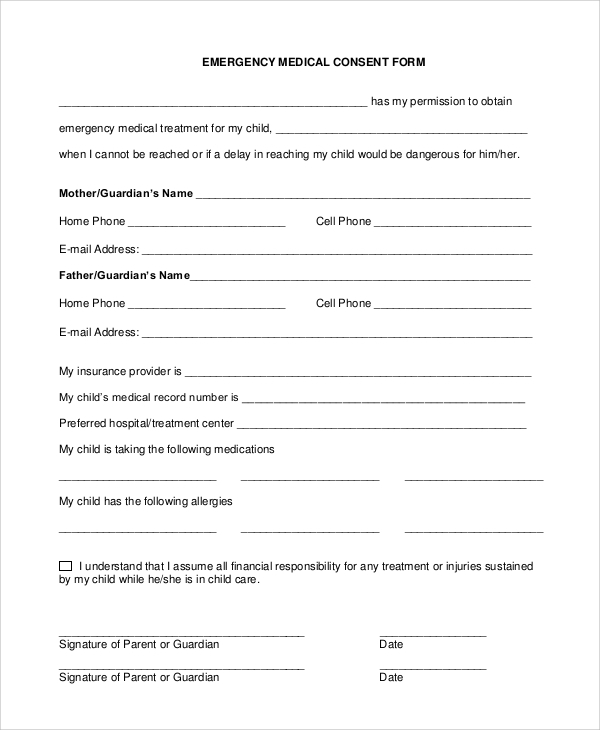 A medical treatment form is a customized document which contains all the medical and health history of your child. These are used in cases you leave the kids at the care of other people like the day-care providers, nurses or other people. 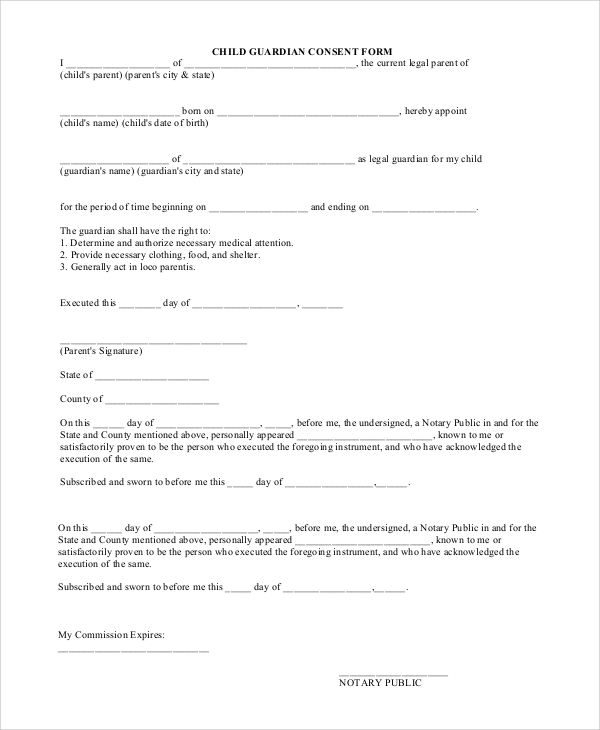 The reason to use a Medical Consent Form is that people taking care of the child need to know about the previous dosages of medicines and meals consumed by the child. 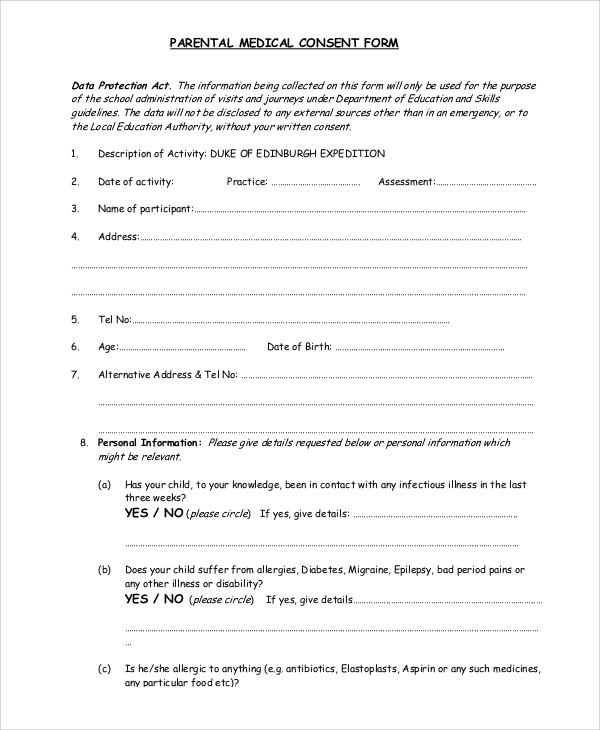 There are various types of medical consent forms in use. Some of the Sample Forms For Download are given below. These forms are personalised for the adults, as many senior citizens require care. It includes their personal information including insurances. It has separate space for other information like allergies, medications, etc. 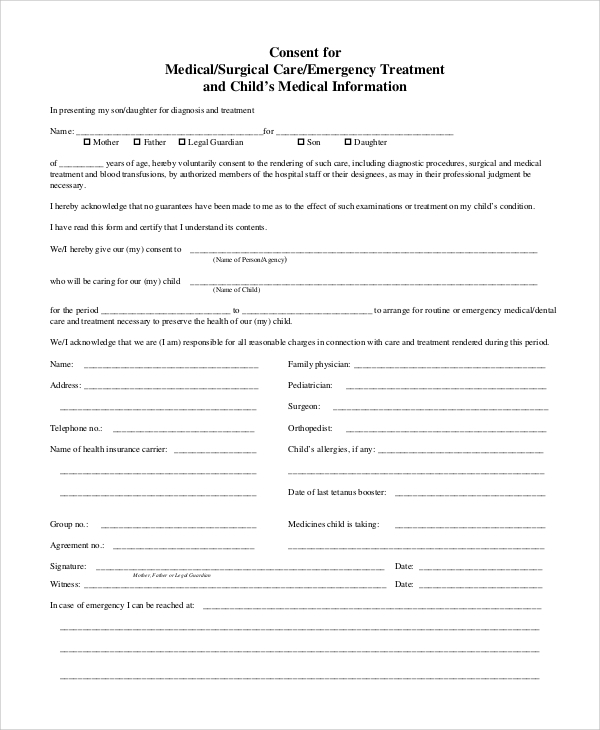 This Child Medical Consent Forms for minors are ideal for children. These contain relevant information on the name of their parents, any syndrome that the child has and the name of the child specialist who looks after him or her. 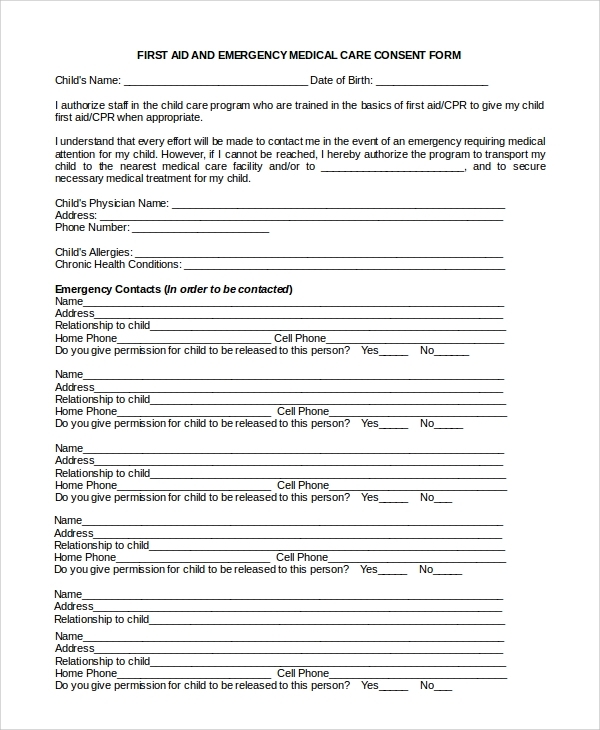 These forms are ought to be filled up by the parents. There are some yes or no type questions, which can yield the medical status of the child. It also has the personal information about the concerned child. 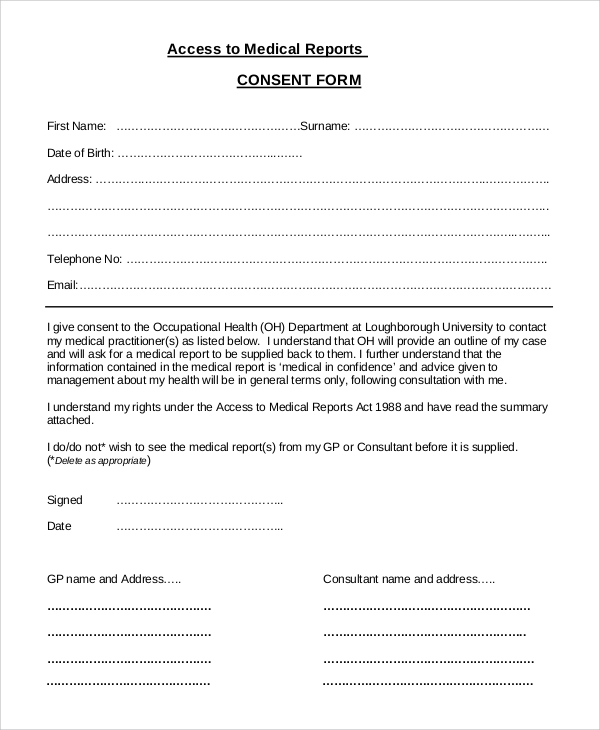 What is the Importance of a Medical Consent Form? 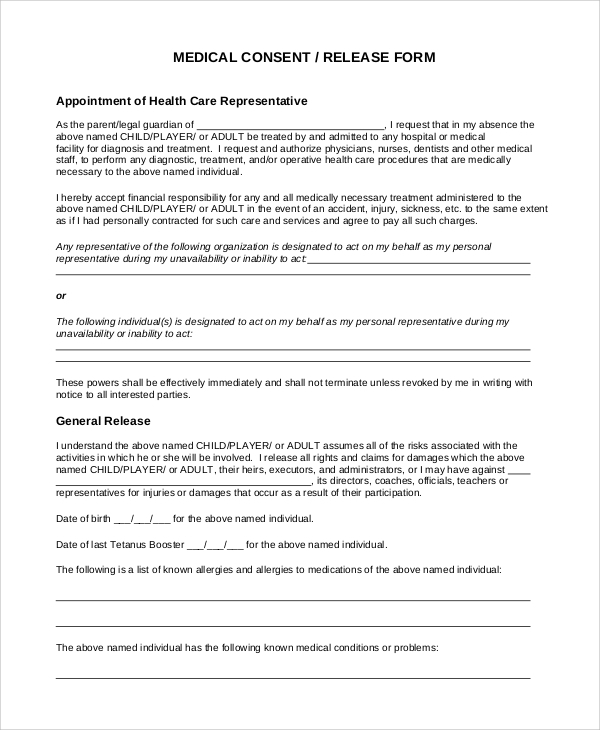 A Sample Medical Forms is important from the perspective that it provides an organized set of information to the people who may take care of the patient. 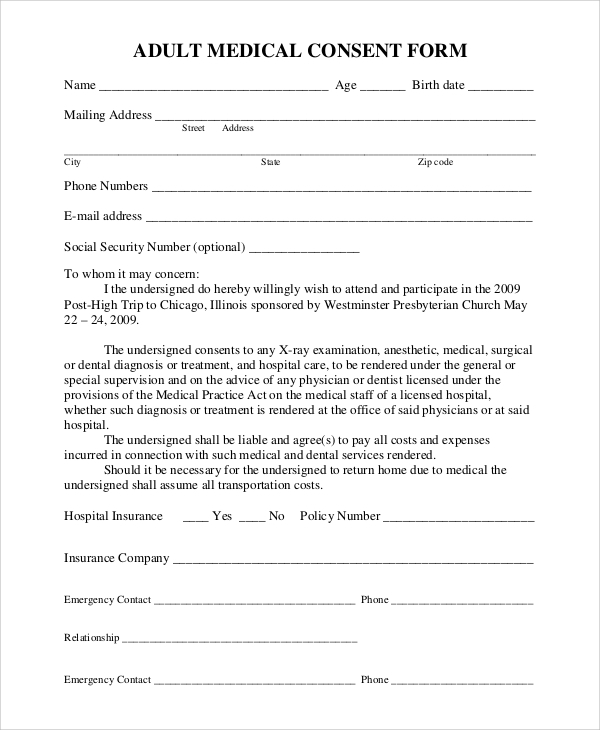 These forms are customized as per the degree of emergency. For instance, day-care takers may not need too many contacts in case there is something emergency with the child, so space is tailored according to the need of the situation. Nurses taking care of senior citizens may be in need of a particular category of form, as older people have more ailments in the body. This is a totally precise form that has relevant information about the identity of the person concerned. Additionally, it states that the guardian has the right to provide all medical help, food and shelter to the child. Since these forms are to be used in the cases of emergencies, they contain specific details. The name of the child’s physician is included at the top. There are complete details of persons to be contacted in case of emergencies. What Information is to be Included in the Form? 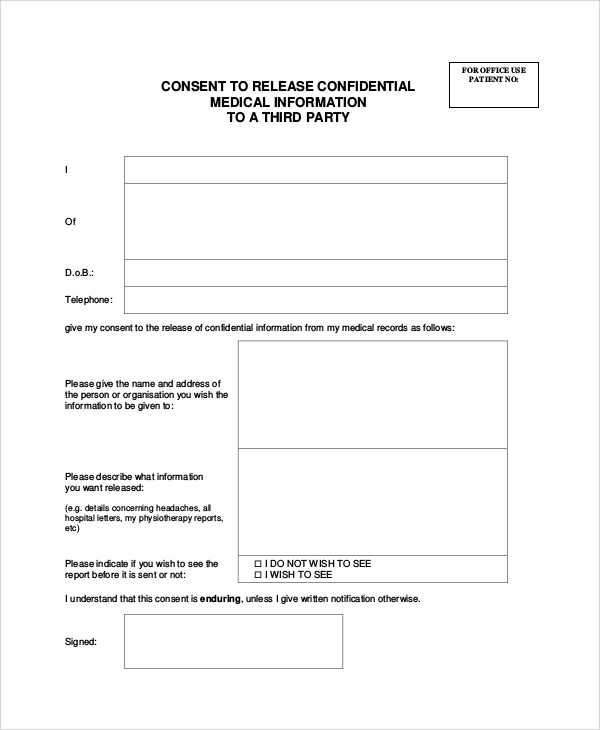 It is important to take a note of the information you are adding in a Medical Consent Forms. It has to include the personal information of the person who is to be taken care of. These include name, address and so on, besides the names of other physicians who are taking care of him or her. Apart from this, there are greater details in case of senior citizens. All his syndrome and problems are to be mentioned. If he takes any pre-medicated drugs or medicines, it has to be explicitly referred to in the form. It is obvious that medical forms are totally customized as per the needs of the organization and person. There are different types of medical consent forms on the website, and you can check out any of them. The BSA Medical Forms are also included there. These forms are tailored as per your needs.